Purchase Information :: Machine Lines Co,.Ltd. We pay top dollar for your machine in cash! We will also consider buying machines that are in the process of being purchased by loan. Your machine can be advertised on the Nanpok website on a consignment basis. If possible, send a picture of the machine that you would like to sell. 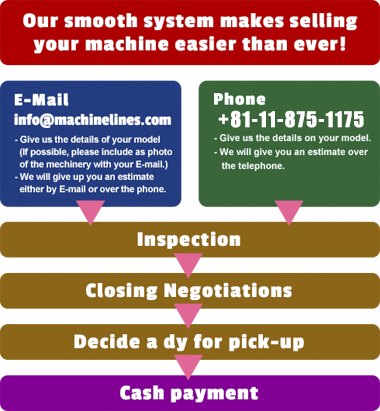 Our smooth system makes selling your machine easier than ever! Give us the details on your model. We will give you an estimate over the telephone. We will give up you an estimate either by E-mail or over the phone.